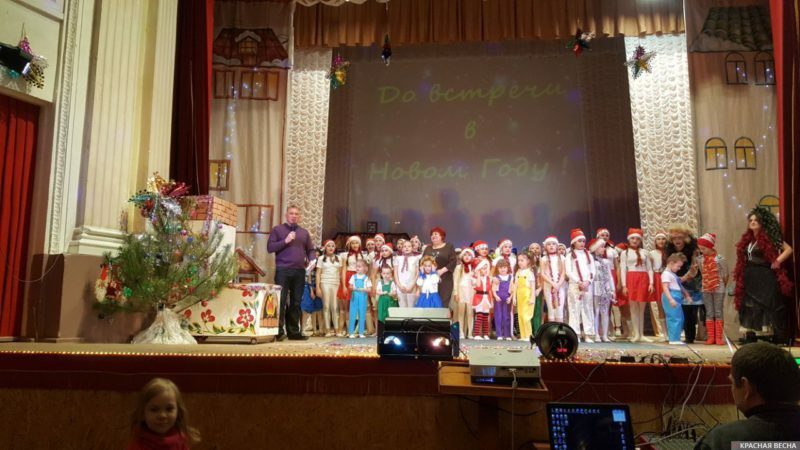 At the Lugansk Republican Cultural Center, a performance titled “A New Year’s Fairy Tale” was held for children of the volunteer fighters, Chernobyl disaster liquidators, and veterans, the Chairman of the Lugansk Union of Afghanistan Veterans Sergey Shonin told a correspondent of the Rossa Primavera Information Agency on January 10. Children of staff from the Marshal Eremenko Republican Veterans and Disabled War Veterans Hospital also attended the celebration. “The performance lasted one hour and a half. Then the children received gifts. The children were very happy. Everything went fine. The gifts were provided by the All-Russian Parents’ Resistance (ARPR), an all-Russian family protection civic organization. The Lugansk Union of Afghanistan Veterans actively cooperates with ARPR helping it to deliver humanitarian aid to children’s and educational institutions of the Lugansk People’s Republic,” Sergey Shonin shared his impressions. The All-Russian Parents’ Resistance (ARPR) all-Russian family protection civic organization helps children’s and educational institutions in Donbass through the Children of Russia to Children of Donbass campaign launched in 2014. In November 2017, with the assistance of the Lugansk Union of Afghanistan Veterans, the ARPR delivered furniture for a kindergarten in the village of Uralo-Kavkaz of the Krasnodonsk municipal council, a water treatment plant for the Yunost swimming pool in Lugansk, and spare parts for the Lugansk College of Physical Education’s bicycle group. This entry was posted in News from Ukraine and tagged All-Russian Parents' Resistance, donbass, LPR, Social War. Bookmark the permalink.